The sixth edition of the international symposium “THE ART OF MUSIC EDUCATION Vol. VI” took place from Wednesday 14 to Friday 16 February 2018. The conference was once again being organised in partnership by the Elbphilharmonie Hamburg and the Körber-Foundation Hamburg, in association with ECHO. The topic of the sixth symposium was “Discovering cultural relations – music institutes in multi-diverse urban societies”. Society needs spaces to gather, people need places to get inspired and for individual and collective reflection. To what extent can concert halls provide such a space – even more so than they are today? How can we explore more the opportunities of different cultures, different ways of participation and perception, the role of cultural heritage, etc. The idea is that the form and the activities of a cultural venue in the 21st century should reflect their role within the urban eco-system. What exactly does this mean however? These were the questions – amongst others – which were addressed and examined during keynotes, discussions, workshops concerts together with 170 participants from 15 European countries. The event was organised by the Körber Foundation and Elbphilharmonie Laeiszhalle Hamburg in partnership with ECHO. The conference explored schools work in relation to cultural institutions. International Seminar: The Knowns and the Unknowns, 14 April 2015 at the Philharmonie Luxembourg. The 14/15 season marked the tenth anniversary of four members of the ECHO network: Casa da Música, Philharmonie Luxembourg, Müpa Budapest and Sage Gateshead. 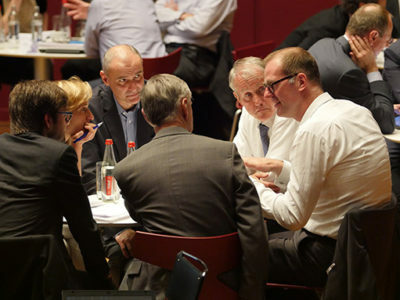 At a seminar open to Concert Hall CEOs from across Europe we explored the learning (both successes and challenges) as the starting point for exchange and shared reflection on the key strategic priorities for Concert Hall life in Europe for the next ten years to come. Together with our partners the Körber Foundation and the Laeiszhalle Elbphilharmonie Hamburg, ECHO was pleased to invite the international community of music educationalists to the fourth edition of THE ART OF MUSIC EDUCATION (which took place from Wednesday 22 January to Friday 24 January 2014) at the Körber Forum in Hamburg, Germany. See below for the video introduction recorded for the event by Herman VAN ROMPUY, President of the European Council. This seminar was organised by ECHO in partnership with Bozar (Centre for Fine Arts Brussels) and PROMETHEA. This event was delivered in partnership with the Körber Foundation and the Laeiszhalle Elbphilharmonie Hamburg. Following the motto “energy through synergy” and incorporating best-practice-examples from concert halls across Europe, this symposium highlighted different models of structural, financial and programmatic cooperation in the field of Music Education. For three intensely rewarding days, 160 members of the international Music Education community (coming from 17 different coutries) explored questions such as: how can collaborative alliances and partnerships be created so that they are both effective and sustainable? How does successful lobbying work? Who are the necessary partners of concert halls and orchestras to ensure the successful communication, delivery and impact of our educational activities and output? In June 2011 ECHO presented the first in its new series of European training seminars open to colleagues from both inside and outside of the ECHO network. This first event was produced by Sage Gateshead, UK, and explored the transformative opportunities offered to the landscape of the performing arts by Digital Media. See below for a short video of the event which featured 30 hours of talks, presentations, debates and performances over two days.